“Deme su manita,” was the first thing my ninety-five-year old Colombian mother-in-law, “Mina,” said to her son Henry every time he entered her home. 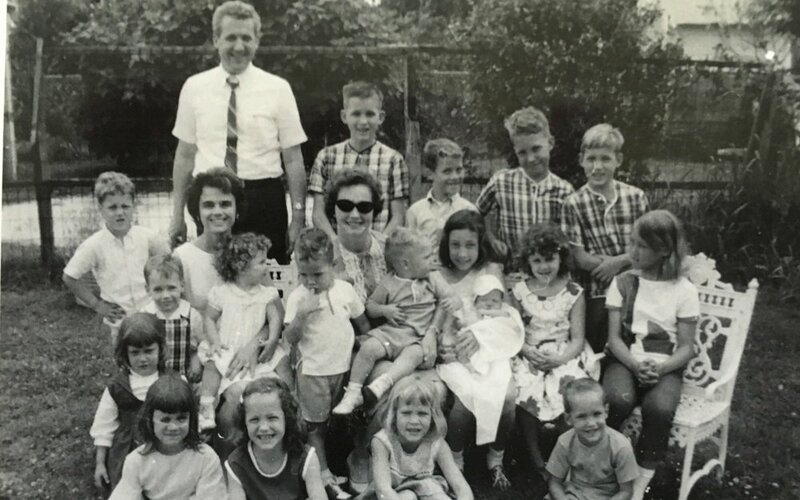 “And once she had my hand, there was no letting go,” Henry shared with our extended family as we gathered after Mina’s funeral on The Feast of the Holy Rosary to have a meal in her honor. It happened so many times that Henry took a picture of Mina holding his hand and placed it in a frame in her living room where she could see it at all times from her chair. Mina took great comfort during the last days of her life in holding our hands, just as we had each received consolation in life by holding hers. Henry shared a vivid memory he had from 1948, when he and his siblings, Bernardo and Hedy, were eating with Mina in a restaurant in their native Bogota. “A revolution broke out and gunshots started firing everywhere,” Henry told us. “We were only four, three and two at the time, and Mina took us by the hand and ducked from alley to alley until she got us home safely.” Though they left Bogota for America shortly thereafter, Henry never forgot how their mother had calmly and coolly led them to safety. Mina’s providing a sense of safety for others was a theme among us as we told our favorite stories about her life, along with the way that she made others feel not only loved and accepted, but truly beautiful. Yes, Mina had taken each of us by the hand at some time in our lives, and she had confidently conveyed through both her immense love for others and her deep faith in God that everything would be okay. I’ll never forget the comfort I took in her presence when her son, my late husband Bernie, was critically ill. Though she was ninety at the time, she insisted that I pick her up in the evenings so she could come to the hospital to hold Bernardo’s hand and pray a Rosary with him, then bathe his face with kisses and tears. Mina’s health sharply declined after Bernardo died, and it was our turn to take her by the hand. Her family members, especially her daughter Hedy and her granddaughters, went to her home often to keep her company and pray with her. Mina was receiving back her own legacy of love and faith, as her family readied her to take the hand of God. In spite of the fact that her life held its deep sufferings, including the heartaches of being widowed in her forties and burying a son and grandson, Mina was secure in the knowledge that God was right beside her, holding her close. Her intense love of God and faith in Him was the foundation of her rich, blessed life. It kept her strong and peaceful until the Feast of the Guardian Angels, when God extended His welcoming, merciful hand to take her home. Thank you, Mina, for your precious love and for your beautiful witness of faith, which impacted our lives so profoundly. You are now in the hands of your Maker. Rest there in sweet peace. For I am the Lord, your God, who grasp your right hand. It is I who say to you, "Fear not, I will help you."